If you haven’t heard of induction cooking, you’re not alone. Though the technology isn’t new, it’s also not widely known. Not gas and not electric, induction cooking doesn’t heat the stove—just the cooking vessel you’re using. Here’s how it works. An induction coil, usually made of copper, sits beneath the cooking surface, in place of a typical gas or electric burner. An oscillating current is run through the wire, producing a magnetic field just above the coil. That magnetic field reacts with the iron or steel in your pots and pans, heating them quickly. (You can only use pots and pans made of steel and cast iron.) The pans in turn radiate the heat to your food. So everything else stays cool, including, theoretically, the cook. And because this method uses about 90 percent of the energy produced (compared to 55 percent for gas and 65 percent for electric ranges), you’ll be saving energy and cash. And your food cooks faster—which is always a plus. Who said a watched pot never boils? In the past, induction ranges have been fairly expensive. At the high end, Viking’s offering is about $6,000, though you can score a GE cooktop (not complete range) for a little over $2,000. 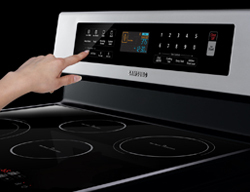 Samsung’s new FTQ307 Induction Range has a list price of $1,999, and can be had for hundeds less in stores. 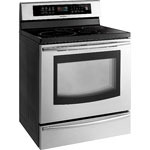 It is stainless steel and includes a warming drawer with three levels of heat. Now if I could only stop storing my bakeware in my warming drawer, this feature would be super cool. The control system is very Blade Runner, with a touch-slide control panel, and there are also self-clean and 20-minute SteamQuick cycles to help you keep things tidy. The best thing, though, is the fact that the range’s surface stays cool to the touch. Yes, the pot will be hot, but the rest is not. And with two kids who like to help (watch) me cook, I like the idea of this. For more information on induction cooking, check out theinductionsite.com.